They’re more eco-friendly than top-loading machines, but front-loading washers don’t let you add forgotten garments once the wash cycle has started. With the addition of a second smaller door, though, Samsung’s new WW8500 AddWash lets you toss in that missing sock you just found. The extra door, located at the top of the washer’s main door, can be unlocked by simply pushing a pause button mid-cycle. The water doesn’t drain from the machine, but it does stop sloshing around so you can slip in additional garments—even as large as sweaters or jeans—without any soapy water spilling out. 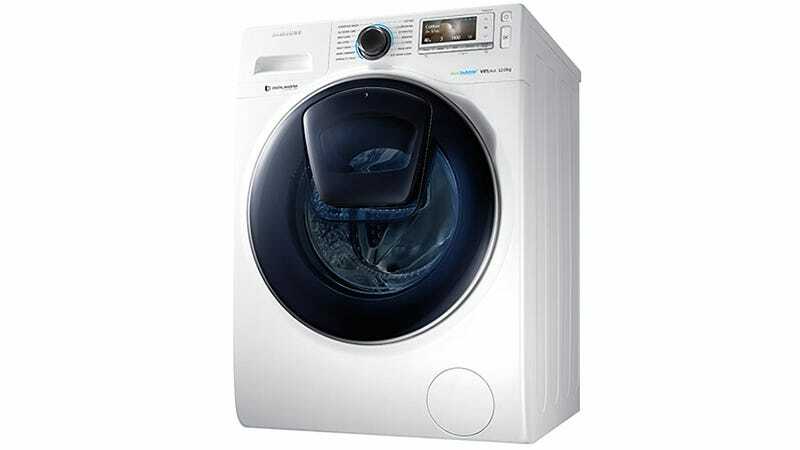 It can also be used for adding extra detergent or even fabric softener halfway through a wash.
There’s no pricing info available just yet, but if you need any more convincing that this is the next washing machine for your laundry room, the WW8500 AddWash also has smartphone notifications. If you’ve got an iOS or Android mobile device handy, you can monitor the progress of a wash. But if you want to add more delicate items closer to the end of a cycle, or fabric softener, you can set up notifications that will let you know when it’s the best time to do so.